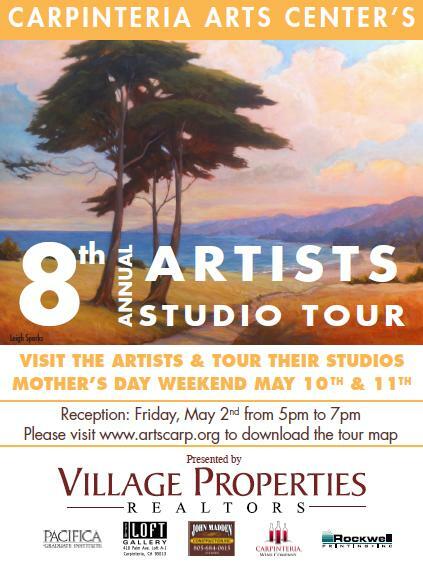 The 8th Annual Carpinteria and Summerland Artists Studio Tour generously presented by Village Properties takes place on Mother’s Day weekend, the 10th and 11th of May from 10am – 5pm. This event is FREE and open to the community. A map and Art Studio Directory will be available both online at www.artscarp.org and from the Carpinteria Arts Center and will guide you through some of the diverse fine artists studios of Carpinteria & Summerland. The Artists Studio Tour is a unique opportunity to view 35 participating local artist studios, some of whom have shown in well-known galleries internationally and in the U.S. from Los Angeles to New York. It is also a chance to see and buy work of established artists as well as budding emerging talent who live in the beautiful Summerland and Carpinteria Valley. Some of this year’s highlights include new works by well-known local artist, Cayetana (Tani) Conrad, daughter of famed author, Barnaby Conrad. Tani is well known for her paintings of figures and landscapes distinctly featuring California colors and light. Her Toro Canyon studio has been featured in a number of magazines and will be open both Saturday and Sunday of the tour. Originally a native of Carpinteria and just returning back to the area from a career in Santa Monica where she was working as an award-winning network TV producer, Danielle Methmann will be showcasing her latest work at Café Luna. Danielle’s photographs exude laid back So Cal lifestyle and beautifully capture the inspiration she gets from her surrounding environments. Danielle’s photographs will be on display at Café Luna both Saturday and Sunday. Open Sunday only studio tour goers seeking an adventurous art studio visit are urged to visit local painter, Thomas Mace’s art studio. Perched atop Shepherds Mesa, Tom built the studio that is his wood shop, idea factory and home for his current projects. Situated in the mountains above Carpinteria, Thomas’ studio is the converted lathe house and a must see. For a full list of participating artists please visit Carpinteria Arts Center website at www.artscarp.org or on Facebook @CarpinteriaArtistsStudioTour. This weekend long opportunity to tour and visit local artist studios is FREE and open to the public. A small percentage of art sales will benefit CVAC’s missions to promote, support our local artists in their studios and galleries, Bellas Artes program, Art by the Sea kids camp, Art in Public Places, Flicks film club and more. In the belief that the arts are vital to a healthy community, the Carpinteria Arts Center is committed to providing challenging exhibitions, innovative learning opportunities, and cultural enrichment for people of all ages, interests, and abilities. The Carpinteria Valley Arts Council would also like to thank Village Properties that generously donated at the Presenting Sponsorship level for this year’s 8th Annual Artist Studio Tour. Visit their website atwww.villagesite.com.